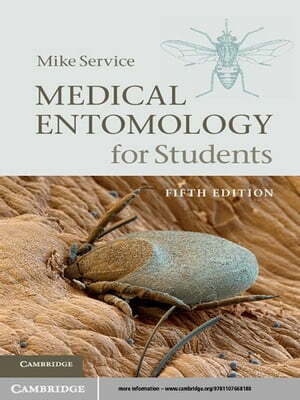 Collins Booksellers - Medical Entomology for Students by Mike Service, 9781139411899. Buy this book online. Despite numerous scientific investigations on vector-borne human infections such as malaria, Lyme disease and typhus these diseases continue to threaten human health. Understanding the role of vectors in disease transmission, and the most appropriate control strategies, is therefore essential. This book provides information on the recognition, biology, ecology and medical importance of the arthropods that affect human health. The fifth edition of this popular textbook is completely updated and incorporates the latest strategies for controlling insects, ticks and mites. Numerous illustrations, with new colour photographs of some of the most important vectors, aid recognition. A glossary of entomological and epidemiological terms is included, along with a list of commonly used insecticides and their trade names. Clearly presented in a concise style, this text is aimed at students of medical entomology, tropical medicine, parasitology and pest control. It is also essential reading for physicians, health officials and community health workers.